Add 1 level scoop of Clean Protein in 8oz of cold water or milk. Make sure to shake well for full mixability, we recommend using a shaker cup. You can vary the amount of liquid based on the consistency and taste you desire. Consume 1 serving of Clean Protein within 30 minutes of your workout. You can also consume Clean Protein throughout the day based on your specific protein intake requirements. ALLERGEN WARNING: This product is manufactured with equipment that processes products that may contain milk, egg, soy, tree nuts, peanuts, wheat, fish, crustaceans & shellfish. Contains milk and soy (as soy lecithin). 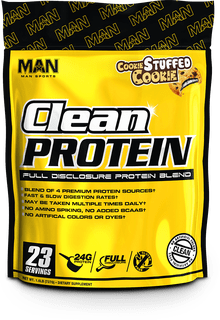 Jun 21, 2016 MAN Sports Clean Protein: A Non-Proprietary Protein Blend! Clean Protein features a full disclosure protein blend. This means you know exactly how much of each protein source you are consuming. Typically blended protein products feature a proprietary blend of ingredients, leaving you in the dark as to what's in them. Unicorn Milk This is a Buy 1 Get 1 FREE offer! Vanilla Ice Cream This is a Buy 1 Get 1 FREE offer!